The kit includes a large, 12x18" wafer mat. Note: Always remember to use safety glasses when cleaving the wafer. 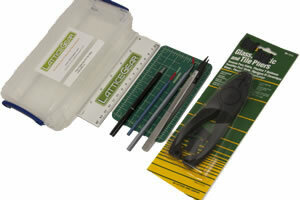 Scribing and Cleaving Kit for Small Samples Includes: clear ruler with metric and imperial/US units, fine tipped sharpie for marking the sample, sample handling tweezers, pen style diamond scriber for scribing prior to cleaving, and small sample pliers for cleaving and a handy carrying case to keep all of the tools together. 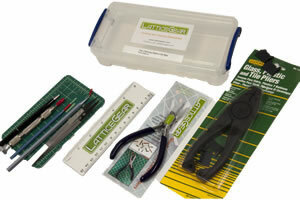 The small sample pliers are custom, handheld cleaving pliers for cleaving samples into pieces from 1 - 30 mm. Stainless Steel covered with plastic handles for strong grip. Soft nylon covered jaws that do not damage your sample. Good for thin and small samples. Lightweight and easy to use. Instructions included. 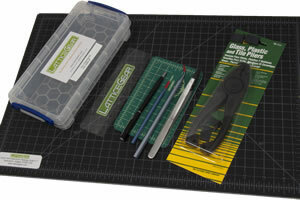 This Cleaving Station includes a 12x18" self healing cutting mat, two diamond scribes for marking and scribing, one pen style diamond scribe and pliers for cleaving, everything in the Cleaving Kit. This is the best scriber you'll ever find for scribing semiconductor wafers. 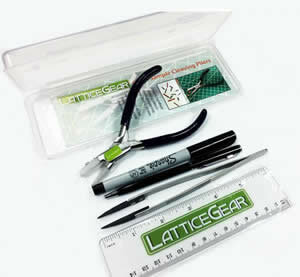 Lattice Scriber is the only scriber that has a 8-point truncated diamond tip that can be used for both toe and heel scribing held by a robust 4" long pin vise handle. CleanBreak 6" wafer cleaving pliers. Simple and clean way to cleave (post scribe) wafers and wafer strips and smaller pieces. ¾" jaw, opening. Comes with one set of replaceable jaws to maintain the best cleaving performance. 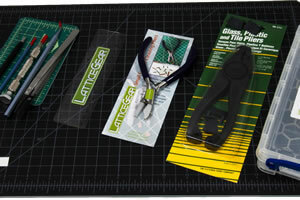 Custom, handheld cleaving pliers cleave small samples into pieces from 1 - 30 mm. Stainless Steel covered with plastic handles for strong grip. Soft nylon covered jaws that do not damage your sample. Good for thin and small samples. Lightweight and easy to use. Simple mechanics make the SSC an important addition to the cross section sample preparation workflow. 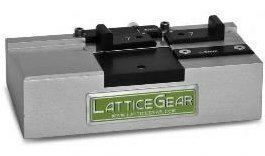 Using simple mechanics, the Small Sample Cleaver (SSC) uses a novel sample holder and a cleaving platform to safely cleave samples into chips as small as 2x2mm. The novel sample holder allows samples from 4-10mm to be held during indenting and cleaving. No more handling samples directly with fingers. Gloved hands are ok, the holder has no screws, springs or pins.